This Holiday season, shop for loved ones who don’t need or want more “stuff”… We have green ideas to add to your shopping list here at Turtle Bay Exploration Park! All proceeds support the world-class ongoing educational and cultural programs at Turtle Bay Exploration Park and are tax-deductible. Give the gift that lasts ALL year long – Gift Memberships at Turtle Bay are $10 off this month! With all new features, play equipment and exhibits in Paul Bunyan’s Forest Camp and blockbuster exhibitions, Design Zone and World’s Largest Dinosaurs, you won’t want to miss 2018 at Turtle Bay. Sponsor the animals of Turtle Bay and make them an honorary part of your family! All animals need lots of love and support, and now you can help support the care and feeding of animals at Turtle Bay through the Adopt-an-Animal Program! Honor your loved ones by giving them a forever home on our River of Turtles! Our remarkable, whimsical display of personally engraved Turtles are visible for all to see and enjoy adjacent to the Turtle Bay Museum entrance and the Museum Store & Coffee Bar. Your generous gift shows lasting support with a personalized Turtle plaque to celebrate a special occasion or honor loved ones. 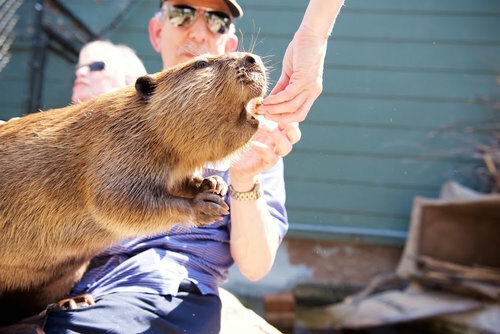 You can book a personalized meet and greet with Timber, our North American beaver! This one of a kind experience cannot be found at any other park in the country.